BadaBingPictures takes a look at newly released Secutor Bellum, the latest gas blow back pistol by Secutor Arms. If you like reviewers who aren’t afraid to give an unbiased review, the good and the bad – he’s one you should definitely subscribe to! If you’ve not heard of them – Secutor Arms is one of the newer brands to airsoft, based in Taiwan. The word ‘Secutor‘ is Latin for the class of a gladiator in Ancient Rome, this is significant as you will notice a Ancient Rome meets Modern Shooter theme on the branding and style of their weapons. Well now it’s time for a M9A1 variant, the Secutor Bellum. 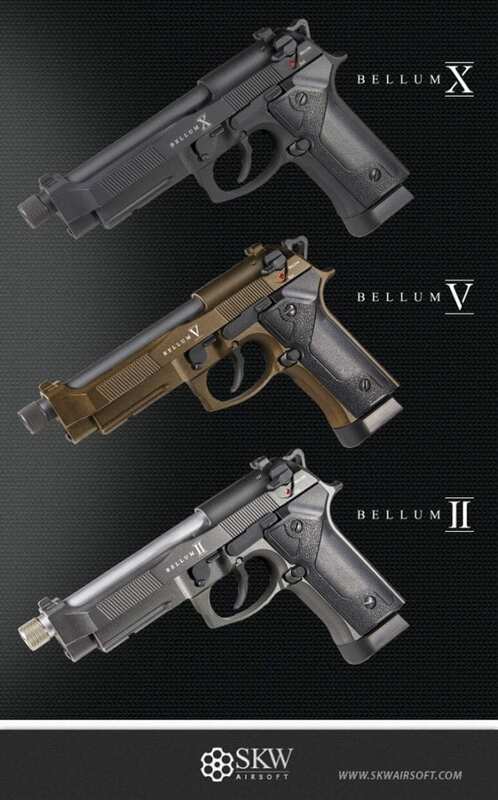 Available in Black, Grey and Bronze – the Bellum is a M9 styled Gas blowback pistol that continues their current lineup. Mostly made of metal, the Bellum comes with a CO2 Magazine, 2 allen keys and an additional nozzle for Winter. Along the top of the pistol are fixed sight posts, oddly they have no markers on them meaning they don’t stand out during target acquisition. On the front of the pistol is a 14CCW threaded barrel, perfect for using tracer units or suppressors. Underneath the pistol is a picatinny rail meeting up with a flat trigger guard, this should provide greater compatibility with pistol torches. Down to the pistol grip, the sides are smooth and this was oddly intentional. Secutor have decided that player’s wanted customisation, and by leaving this open it allows for custom stippling and designs. In addition to no stippling, there isn’t a lanyard tab. So for any players who are prone to losing their kit, this might be a pistol you only see once or twice before forgetting where you put it down. Now, the magazine holds 25 BBs and Secutor should be releasing green gas magazines shortly, although the performance of previous pistols definitely lacked using Green Gas. As the pistol comes with both a summer and winter nozzle, I personally recommend you continue to use the Bellum with CO2, swapping out the nozzles to ensure you’re within the site joule/fps limits. For spare parts In terms of compatibility, this pistol comes from the KJW factory so there are plenty of available M9 parts along with accessories like holsters and torches. If you already have an Tokyo Marui M92F, the magazines will fit straight out the box.